Where should the wedding take place? Apart from choosing the perfect wedding dress, perhaps the hardest part of arranging your vintage wedding is finding the perfect venue for your special day. If you’re not planning on having a church wedding, you might feel spoiled for choice with all the options out there, but if you’re going with a vintage theme, finding somewhere that complements the style of the entire day is essential. We’ve been rounding up some of the best vintage wedding venues in the UK for you so that you can find it easier to choose the right one to meet your needs. If you’re planning a glamorous 1920s or 1930s wedding with a floor sweeping gown, Farbridge in West Sussex is the ideal venue for you. 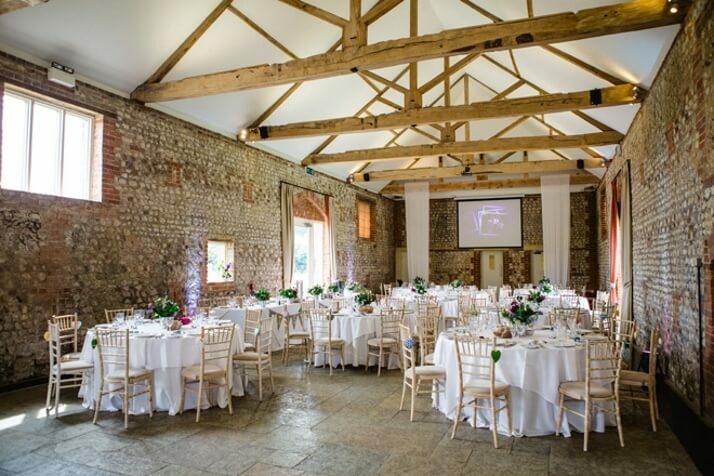 Located close to Chichester, this is one of the top vintage venues in the UK thanks to its rural and rustic elegance. 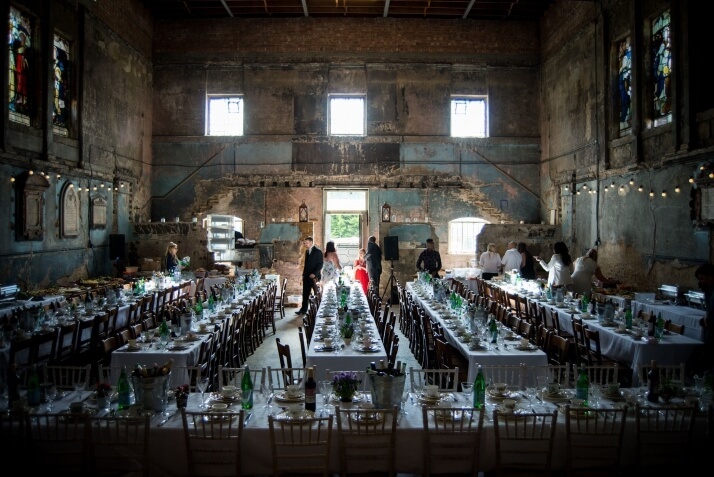 The exposed brickwork is the perfect backdrop to your wedding photos while the huge windows promise plenty of natural light for the perfect shot. Your vintage dress and veil will perfectly skim the flagstone floors as you walk down the aisle, and even better, the countryside for miles around makes you feel as though you’ve truly gone back in time. If you’re marrying during the summer months, you may be dreaming of a beautiful outdoor ceremony. You’ll get that and more at Larmer Tree Gardens in Wiltshire. 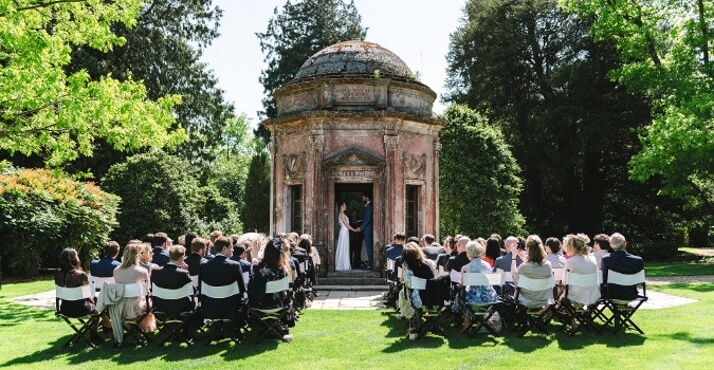 With its Victorian chic backdrop, these gardens are one of the most spectacular outdoor spaces in Wiltshire, and the stunning pagoda is the ideal place to exchange your vows before dancing all night on the lawns. Right by the venue there is an beautiful open space where you can park your wedding car and take amazing wedding pictures. 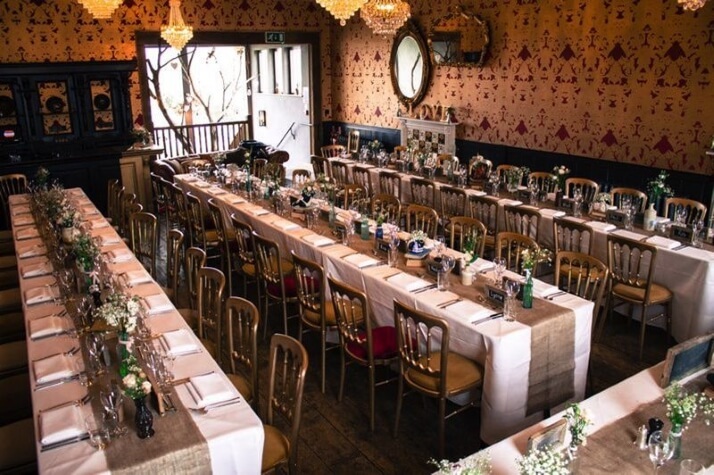 If you’re having an informal wedding, or a 1940s style celebration, The Bell in Ticehurst, East Sussex, is an ideal venue. During the war years, receptions in local pubs were popular, and you can emulate this tradition at this quirky venue with its traditional touches. The unique décor of this venue means that finding unusual backdrops for your wedding photos will be a breeze and since the parish church is right across the street you won’t have far to travel for drinks and food! 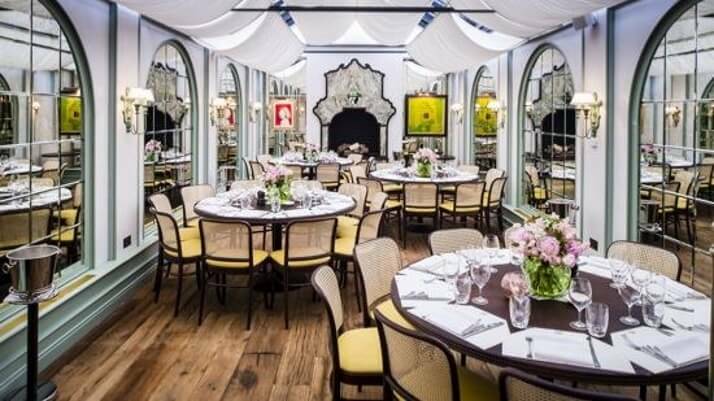 Quirky, stylish and in the heart of fashionable Chelsea, Daphne’s Restaurant offers a truly eclectic and vintage wedding venue in the capital city itself. Serving up tasty Italian food, you can choose this venue either for your reception or for the celebration itself – before the brick fireplace is the ideal place to exchange your vows – and it looks wonderful when decorated with plenty of crisp white detailing and bright hand-tied flower bouquets.Check out their offical website. If you want a venue that is as unique as it is impressive, the crumbling Caroline Gardens Chapel could be the ideal spot for your big day. Reminiscent of the venue for the ill-fated Ross and Emily wedding in Friends, this chapel in the heart of Peckham in the capital’s East End, will make any creative bride and groom thrilled with excitement at the possibilities. Whichever era you’re theming your ceremony around, you’ll be able to achieve the style you’ve dreamed of here. Lots of the original features of the chapel remain in place, including the stunning stained glass windows, and the beautiful patterns and colours they cast on the floor only adds more beauty to an already beautiful spot. Not only can you say “I do” here, but you can also host your reception in this unique space. Why not decorate the tables with vintage style doilies, glass bottles and vases of single white roses to maximise this venue’s potential. Having a vintage themed wedding that oozes with style and old school elegance at the Beach Blanket Babylon right in the centre of fashionable Notting Hill. 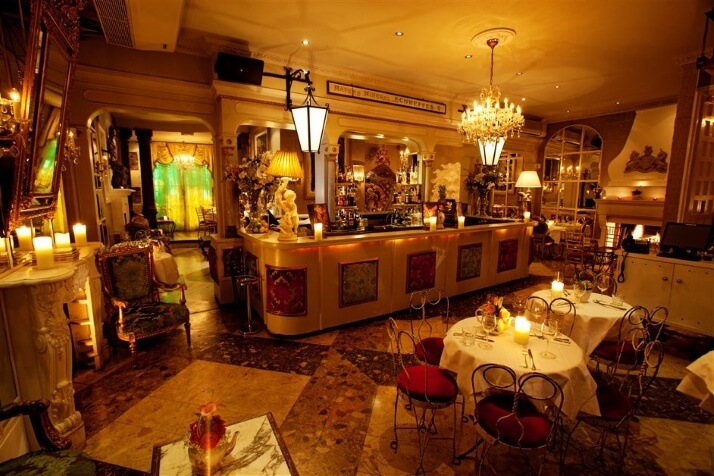 Right in the heart of the capital city, this stylish venue boasts a host of lavish and luxurious features from draped sumptuous curtains to make you feel warm and welcomed, to crystal chandeliers that promise the best in old world glamour. Feature fireplaces are everywhere while the polished wood floors are perfect for dancing the night away. This venue has no less than four different spaces to choose from depending on the number of guests you’re inviting, but all have a wonderful feeling of intimacy. From as few as 15 guests right up to 70, you can benefit not only from unique and beautiful spaces in which to exchange your vows but also private dining and cocktail service for a wedding day you’ll never forget. The crypt is an especially unique space for an unusual vintage inspired wedding day.